I am participating in Picture Books 14:14, a challenge created by Christie of Write Wild that encourages bloggers to review 14 picture books in 14 days, starting on Feb. 14th. As soon as I saw the topic of word play, I knew that I had to include E-Mergency!. 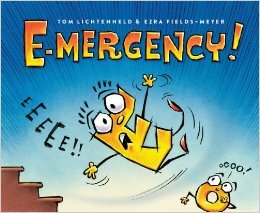 Our school was lucky enough to have Tom Lichtenheld come for an extended author visit a few years back, and E-Mergency! has been a permanent favorite since then. My copy is so terribly battered that even the tape has been taped. E-Mergency! 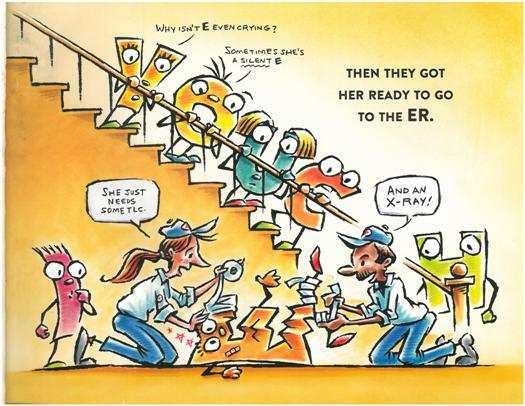 tells the story of what happens when letter E came down the stairs a little too fast and had to be taken to the emergency room. All of the other letters realize that they must work together to lessen E's workload, and poor O is chosen to do the heavy lifting. This is when the word play really kicks into high gear. A: E is injorod and can't work, so O must bo usod instoad of E.
! : Do! Not! Uso! E! Until! Sho! Rocovors! Or! You! Could! Inflict! Pormanont! Injury!! See what I mean? And it just gets better from there. From store signs to newspapers to student lunch menus, the loss of E impacts everything. But E is still not getting better. Only after several false attempts do the letters discover the root cause - the narrator has continued to use the letter E. Once the fourth wall has been broken and the narrator chastised, then E is able to return to her usual, perky self. The word play is constant throughout this book and even hidden in the illustrations. The letters are always arranged intentionally in every layout, and deciphering these hidden gems will keep kids returning to this book again and again. If you look carefully at the opening spread with the house, you will find D and C discussing comics in the attic, N and V eyeing I's kite, Z trying to sleep, F getting reprimanded for his report card, and more. Want more picture book analyses? Click here to read my other posts for Picture Books 14:14 or check out these other great posts for the Picture Book 14:14 Challenge going on the rest of this month. That sounds hilarious! I had so much fun just reading those two lines you included. And those allusions in the illustrations are fantastic. Thanks for sharing! My students found so many more 'in jokes' than even I realized - this is one they will come back to again and again! This PB has an awesome concept. Thanks for sharing a few lines. And the cartoon style illustrations are perfect. Thanks, Manju. This one has just so many amazing puns hidden in it. It is a treasure. Oh, my. I can see why one might need to practice before reading this aloud to children. Quite a challenge. I love the joke on the pages you shared. (Why isn't E even crying? Sometimes she's a silent E.) Don't know why but that made me smile a big smile. Hee hee. It's tiny precious jokes like that, which you could read right through without noticing, until you brain catches on a few moments later ... perfect. Haha! Loved the video Katie. Amazing, and extreme wordplay going on. I can understand how this would be fascinating to readers. Thanks, Damon. It is an ideal word play book, for sure. Lovo tho word play! Yos I'll practico boforo I road it! Whoo-hoo, Juliana! Bonus points for an in-stylo commont! This one amazingly fun, Lindsay. Hello! I found you via Kid Lit Blog Hop. Great post - my students loved this book! Thanks so much, Carrie! Glad to hear it!